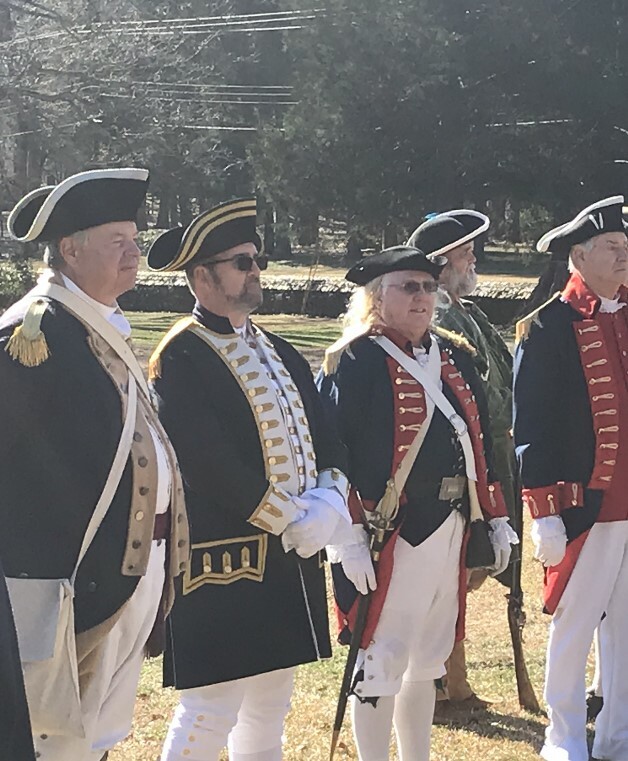 New Bern Chapter President Jay DeLoach and Vice President Bob Ainsley participated in the 238th Anniversary of the Battle of Cowan’s Ford on January 26 at the Hopewell Presbyterian Church in Huntersville, NC. The commemoration ceremony was hosted by Mecklenburg Chapter of the North Carolina Society of the Sons of the American Revolution. The Battle of Cowan’s Ford was a rear guard action fought on February 1, 1781 by Patriot forces led by General William Davidson to delay the British forces under Lord Cornwallis from crossing the Catawba River in their attempt to catch General Nathaniel Greene’s army. The Patriot forces were successful in delaying the British but General Davidson was shot and killed in the skirmish. He is buried in the cemetery at Hopewell Presbyterian Church. New Bern Chapter President Jay DeLoach rendering honors during the wreath laying ceremony as Mecklenburg Chapter Vice President Steve McKee presides.